The book is more a collection of stories of greatness and lore more so than an actual checklist of stuff to do, so the book has a bit of a misleading title. It is part of a series of books by Triumph which includes many other sports, as well as another hockey title, 100 Things Flyers Fan Should Know And Do Before They Die. The Bruins have been around since 1924, so the amount of history to be covered by a book like this is plentiful. Author Matt Kalman does a good job in covering all the major events and key figures in Bruins history. This is a fun and interesting read, presented very much in Brian McFarlane style in his Original Six series. It can be read cover to cover or just a few passages at a time. is a great selection for the Bruins fan on your Christmas list. Over 300 pages of good reading and history, as well as a spattering of black and white photos and inserts, all for a jacket price of $14.95. In reality you can find it in most stores and online for about 10 bucks. The storied Boston Bruins NHL franchise has long been full of pride and passionate fans, and the team has provided decades of incredible memories for its legion of loyal followers. But even the most die-hard fans don’t know everything they should about their Bruins. Whether you’re a die-hard fan from the days of Phil Esposito or a new supporter of Tuukka Rask, this book contains all the things Bruins fans should actually see and do in their lifetime. 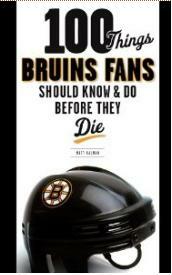 If you bleed black and gold, then 100 Things Bruins Fans Should Know And Do Before They Die is for you. The book features a foreword by former Bruins star Mike Milbury, and offers the chance to be certain you are knowledgeable about the most important facts about the team, the traditions, and what being a Bruins fan is all about.